Reading and share top 62 famous quotes and sayings about Pebbles by famous authors and people. 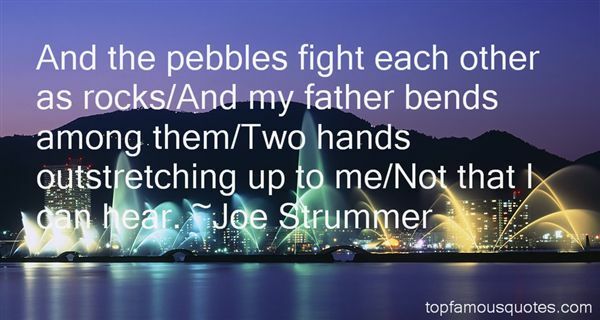 Browse top 62 famous quotes and sayings about Pebbles by most favorite authors. 1. "When he did appear his eyes were as brown as I remembered, pupils flecked with gold like beach pebbles." 2. "I write so that my handful of pebbles, cast daily into still waters, will produce a ripple." 3. "My life is full of mistakes. They're like pebbles that make a good road." 5. "The keeping of lists was for November an exercise kin to repeating of a rosary. She considered it neither obsessive nor compulsive, but a ritual, an essential ordering of the world into tall, thin jars containing perfect nouns. Enough nouns connected one to the other create a verb, and verbs had created everything, had skittered across the face of the void like pebbles across a frozen pond. She had not created a verb herself, but the cherry-wood cabinet in the hall contained book after book, jar after jar, vessel upon vessel, all brown as branches, and she had faith." 6. "This girl's out of her mind, about two pebbles short of a cave-in." 7. "There's a willow tree that stands by my river She holds me in her arms when I am cold. And we listen to the sounds Of the pebbles on the ground, And I know what it means to be old." 8. "From the dim regions beyond the mountains at the upper end of our encircled domain, there crept out a narrow and deep river, brighter than all save the eyes of Eleonora; and, winding stealthily about in mazy courses, it passed away, at length, through a shadowy gorge, among hills still dimmer than those whence it had issued. We called it the "River of Silence"; for there seemed to be a hushing influence in its flow. No murmur arose from its bed, and so gently it wandered along, that the pearly pebbles upon which we loved to gaze, far down within its bosom, stirred not at all, but lay in a motionless content, each in its own old station, shining on gloriously forever." 9. "Lay down these wordsBefore your mind like rocks. placed solid, by handsIn choice of place, setBefore the body of the mind in space and time:Solidity of bark, leaf, or wall riprap of things:Cobble of milky way. straying planets,These poems, people, lost ponies withDragging saddles -- and rocky sure-foot trails.The worlds like an endless four-dimensionalGame of Go. ants and pebblesIn the thin loam, each rock a word a creek-washed stoneGranite: ingrained with torment of fire and weightCrystal and sediment linked hot all change, in thoughts,As well as things." 10. "I consider the positions of kings and rulers as that of dust motes. I observe treasure of gold and gems as so many bricksand pebbles. I look upon the finest silken robes as tattered rags. I see myriad worlds of the universe as small seeds offruit, and the greatest lake in India as a drop of oil on my foot. I perceive the teachings of the world to be the illusion of,magicians. I discern the highest conception of emancipation as golden brocade in a dream, and view the holy path of theilluminated one as flowers appearing in one's eyes. I see meditation as a pillar of a mountain, Nirvana as a nightmare ofdaytime. I look upon the judgment of right and wrong as the serpentine dance of a dragon, and the rise and fall of beliefsas but traces left by the four seasons." 11. "The farm brook ran down from the mountain in a straight line for the fold then swerved to the west to go its way down into the marshes. There were two knee-high falls in it and two pools, knee-deep. At the bottom there was shingle, pebbles and sand. It ran in many curves. 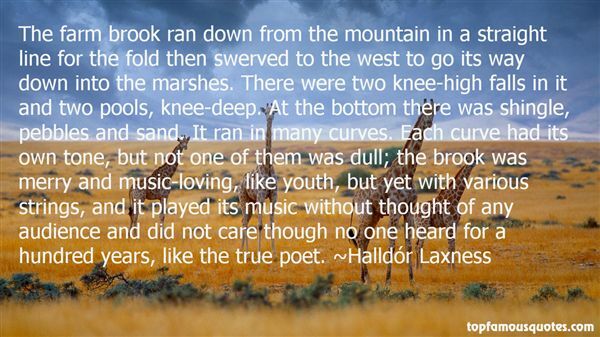 Each curve had its own tone, but not one of them was dull; the brook was merry and music-loving, like youth, but yet with various strings, and it played its music without thought of any audience and did not care though no one heard for a hundred years, like the true poet." 12. "The shore is of pebbles, and huge tangles of seaweed float in the bay and look like the hair of the drowned." 13. "They might just as well have been throwing pebbles into an empty cave." 14. "Problem is, once I sit at my desk and put all these down on paper. I realize something vital is missing. It doesn't crystallize - no crystals, just pebbles. And I'm not transported anywhere." 15. "What I want is to open up. I want to know what's inside me. I want everybody to open up. I'm like an imbecile with a can-opener in his hand, wondering where to begin – to open up the earth. I know that underneath the mess everything is marvelous. I'm sure of it.I know it because I feel so marvelous myself most of the time. And when I feel that way everybody seems marvelous… everybody and everything… even pebbles and pieces of cardboard… a match stick lying in the gutter… anything… a goat's beard, if you like. That's what I want to write about… and then we're all going to see clearly, see what a staggering, wonderful, beautiful world it is." 16. "And even as this old guide-book boasts of the, to us, insignificant Liverpool of fifty years ago, the New York guidebooks are now vaunting of the magnitude of a town, whose future inhabitants, multitudinous as the pebbles on the beach, and girdled in with high walls and towers, flanking endless avenues of opulence and taste, will regard all our Broadways and Bowerys as but the paltry nucleus to their Nineveh. From far up the Hudson, beyond Harlem River where the young saplings are now growing, that will overarch their lordly mansions with broad boughs, centuries old; they may send forth explorers to penetrate into the then obscure and smoky alleys of the Fifth Avenue and Fourteenth Street; and going still farther south, may exhume the present Doric Custom-house, and quote it as a proof that their high and mighty metropolis enjoyed a Hellenic antiquity." 17. "When I was a boy, playing at the beach, I remember a game I loved, which was an omen of my future life. I would dig a channel with high sides in the sand for the sea to fill. But when the water flooded the path I created for it with such violence that it destroyed everything in its way: my castles made of pebbles, my dikes of sand. It swept away everything, destroying it all, then disappeared, leaving me with a heavy heart, yet not daring to ask for pity, since the sea had only responded to my call. It's the same with love. You call out for it, you plan its course. The wave crashes into your heart, but it's so different from how you imagined it, so bitter and icy." 18. "There is the moment when the silence of the countryside gathers in the ear and breaks into a myriad of sounds:a croaking and squeaking, a swift rustle in the grass, a plop in the water, a pattering on earth and pebbles, and high above all, the call of the cicada, The sounds follow one another, and the ear eventually discerns more and more of them -just as fingers unwinding a ball of wool feel each fiber interwoven with progressively thinner and less palpable threads, The frogs continue croaking in the background without changing the flow of sounds, just as light does not vary from the continues winking of stars, But at every rise or fall of the wind every sound changes and is renewed. All that remains in the inner recess of the ear is a vague murmur: the sea." 19. "Stevie Kosgrov recently enjoyed a bowl of Fruity Pebbles (with milk that had hit its expiration date, oh, maybe a month ago)." 20. "All things resist destruction, according to their capacity. Rocks, pebbles, diamonds. Unity is instinctive to being." 21. "As a kid I collected stamps, pebbles on the beach, anything. I liked to have at least 10 of something." 22. "And the pebbles fight each other as rocks/And my father bends among them/Two hands outstretching up to me/Not that I can hear." 23. "I sometimes, in my sprightly moments, consider myself, in my great chair at school, as some dictator at the head of a common-wealth. In this little state I can discover all the great geniuses, all the surprising actions and revolutions of the great world in miniature. I have several renowned generals but three feet high, and several deep-projecting politicians in petticoats. I have others catching and dissecting flies, accumulating remarkable pebbles, cockleshells, etc., with as ardent curiosity as any virtuoso in the Royal Society …. At one table sits Mr. Insipid foppling and fluttering, spinning his whirligig, or playing with his fingers as gaily and wittily as any Frenchified coxcomb brandishes his cane and rattles his snuff box. At another sits the polemical divine, plodding and wrangling in his mind about Adam's fall in which we sinned, all as his primer has it." 24. "The scrape and snap of Keds on loose alley pebbles seems to catapult their voices high into the moist March air blue above the wires." 25. "Nothing like poetry when you lie awake at night. It keeps the old brain limber. It washes away the mud and sand that keeps on blocking up the bends.Like waves to make the pebbles dance on my old floors. And turn them into rubies and jacinths; or at any rate, good imitations." 26. "They do it in Thai restaurants in London. You ask for a drink, and it comes in a glass with loads of seaweed and pebbles in it like a scene from Finding Nemo." 27. "Words are not pebbles in alien juxtaposition." 28. "He made a story for all of them, a story to give them strength. The words of the story poured out of his mouth as if they had substance, pebbles and stone extending to hold the corporal up...knees from buckling...hands from letting go of the blanket." 29. "The little boy I watched throwing pebbles into the empty fountain, he wasn't too old to climb trees. You could tell he had too much wisdom for his age. Probably he believed that he wasn't made for this world. I wanted to say to him: If not you, who?" 30. "For her I changed pebbles into diamonds, shoes into mirrors, I changed glass into water, I gave her wings and pulled birds from her ears and in her pockets she found the feathers, I asked a pear to become a pineapple, a pineapple to become a lightbulb, a lightbulb to become the moon, and the moon to become a coin I flipped for her love..."
31. "Not hammer-strokes, but dance of the water, sings the pebbles into perfection." 32. "The Sand Pebbles has always been one of my favorite films, I suppose because its the most difficult film - from a physical and logistical standpoint - that I've ever made." 33. "Your lingering presence erodes me. Heartbeat by heartbeat. Cell by aging cell. Washing away any sense of self I ever had. Intruding into a nothingness I've struggled to find the pieces to fill. A jar filled with stones, piled with pebbles, topped with sand, only to be left with the knowledge that water, with enough time and persistence, has the power to wash it all away.Your name is on my lips. Frozen. A familiar cadence of syllables that once soothed me. A name I can't speak. Can't think of.Not on this shore, at our lake. Not on this day. When only a year ago, with a foreshadowing that is now ice in my veins, you stood next to me, in this jacket, your hand in mine, so warm, and stared out at this expanse and whispered in awe, "This is what a cold lake looks like." 34. "Tears fill her eyes, making the hazel colour sparkle like pebbles at the bottom of a clear stream when the sun shines on them." 35. "You're paved in my heart like an old road. Like the pebbles in a pebble field, dirt in dirt, dust in dust, cobwebs in cobwebs." 36. 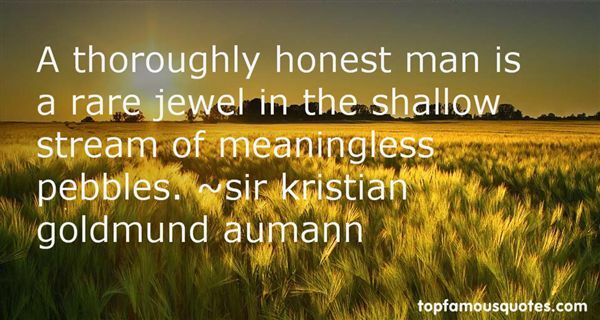 "A thoroughly honest man is a rare jewel in the shallow stream of meaningless pebbles." 37. "I respond, thoughts dropping away, like pebbles plopping one by one in water, sinking down, down into dark oblivion." 38. "Imagination transforms one substance into another. It changes what is into what might be, what was into what might have been. Straw becomes gold, gold straw, and neither is more real nor, I submit, more precious than the other. Pebbles turn into luminous pearls and pearls into little gray rocks, both solid and beautiful, both essential. Human beings take shape from clay, angels' wings are spun out of water, fire gives rise to the long tongues of demons, love emerges out of thin air, and the basic elements reconstitute themselves again and again. "-The Man In The Ceiling"
39. "This was supposed to be yesterday. I was sitting on the Cardiff/London train, supposedly about to write this very column, and realising something quite terrible. My head was entirely empty. A vast echoing void. Bigger on the inside, but with nothing in it. You could drop a pebble in my brain and wait for an hour to hear it land. No actually, you couldn't - that would be aggressive and unhelpful, so keep your damn pebbles to yourself." 40. "I may be smelly and I may be old, Rough in my pebbles, reedy in my pools, But where my fish float by I bless their swimming, And I like the people to bathe in me especially women." 41. "I live myself with my cat Pebbles. She isn't enjoying the attention as much as me - she ran off up the stairs as soon as the film crew for the show came into the house. She didn't come down for hours. But I have the support of all my brothers and sisters and my neighbours and friends - everyone thinks it's just great." 42. "The silence drew off, baring the pebbles and shells and all the tatty wreckage of my life." 43. "I went back every evening, after work, for nearly a year. I learned the meaning of the cud of a leaf and the glisten of wet pebbles, and the special significance of curves and angles. A great deal of the writing was unwritten. Plot three dots on a graph and join them; you now have a curve with certain characteristics. Extend that curve while maintaining the characteristics, and it has meaning, up where no dots were plotted.In just this way I learned to extend the curve of a grass-blade and of a protruding root, of the bent edges of wetness on a drying headstone. I quit smoking so I could sharpen my sense of smell, because the scent of earth after a rain has a clarifying effect on graveyard reading, as if the page were made whiter and the ink darker. I began to listen to the wind, and to the voices of birds and small animals, insects and people; because to the educated ear, every sound is filtered through the story written on graves, and becomes a part of it. ("The Graveyard Reader")"
44. "If she answered, he could not hear it, and he certainly couldn't see her, so he went. First he crawled the rocks one by one, one by one, till his hands touched shore and the nursing sound of the sea was behind him. He felt around, crawled off and then stood up. Breathing heavily with his mouth open he took a few tentative steps. The pebbles made him stumble and so did the roots of trees. He threw out his hands to guide and steady his going. By and by he walked steadier, now steadier. The mist lifted and the trees stepped back a bit as if to make the way easier for a certain kind of man. Then he ran. Lickety-split. Lickety-split. Looking neither to the left nor to the right. Lickety-split. Lickety-split. Lickety-lickety-lickety-split." 45. "Those who collect pebbles rarely climb mountains." 46. "All mists curl off the roof of my being. That confidence I shall keep to mydying day. Like a long wave, like a roll of heavy waters, he went over me, his devastating presence - dragging me open, laying bare the pebbleson the shore of my soul. It was humiliating; I was turned to small stones." 47. "Treading the soil of the moon, palpating its pebbles, tasting the panic and splendor of the event, feeling in the pit of one's stomach the separation from terra... these form the most romantic sensation an explorer has ever known..."
48. "...but Lake Pepin might be best known to most of the world as the place where, more than a hundred and thirty years ago, a little kid picked up too many pebbles." 49. "We say 'forest' but this word is made of the unknown, the unfamiliar, the unencompassed. The earth. Clods of dirt. Pebbles. On a clear day you rest among ordinary, everyday things that have been familiar to you since childhood, grass, bushes, a dog (or a cat), a chair, but that changes when you realize that every object is an enormous army, an inexhaustible swarm." 50. "However, whatever frightening mask it might assume, the national spirit in its original state was of pristine whiteness. Traveling through a country like Thailand, Honda realized more clearly than ever the simplicity and purity of things Japanese, like transparent stream waterthrough which one could glimpse pebbles below, or the probity of Shinto rites. Honda's life was not imbued with such spirit. Like the majority of Japanese he ignored it, behaving as though it did not exist and surviving byescaping from it. All his life he had dodged things fundamental and artless: white silk, clear cold water, the zigzag white paper of the exorciser's staff fluttering in the breeze, the sacred precinct marked by a torii, the gods'dwelling in the sea, the mountains, the vast ocean, the Japanese sword with its glistening blade so pure and sharp. Not only Honda, but the vast majority of Westernized Japanese, could no longer stand such intensely native elements."